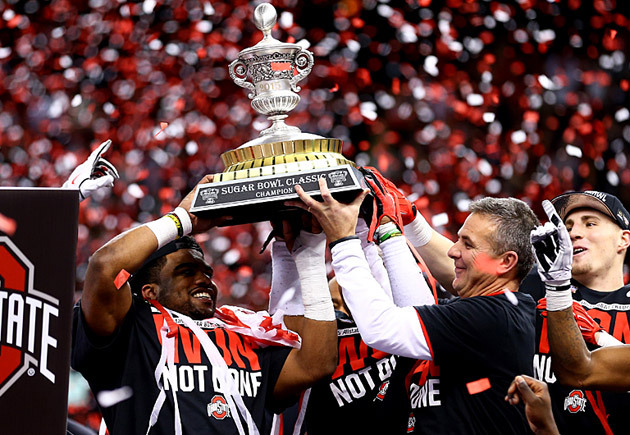 Ohio State beat Alabama 42-35 in the Sugar Bowl College Football Playoff semifinal to shift the national landscape of the sport. NEW ORLEANS -- The play that changed everything -- the game, the first-ever College Football Playoff and the sport’s landscape across the nation -- came late in the fourth quarter of No. 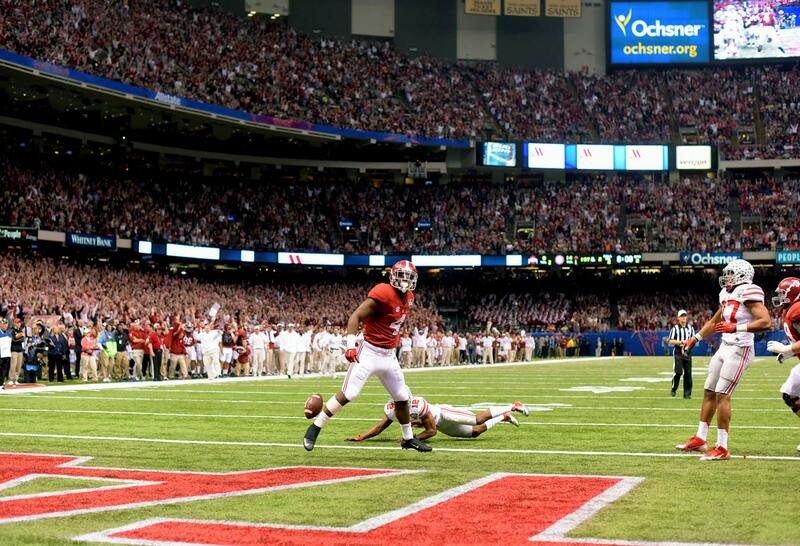 1 Alabama’s gripping Sugar Bowl semifinal against No. 4 Ohio State. The Buckeyes spent a majority of the period in the shadows of their goalposts, languishing on offense while trying to protect a precious one-score lead. But a quarter of offensive futility vanquished in the most fitting manner possible: with a burst of speed. Ohio State tailback Ezekiel Elliott received an inside handoff, rocketed through a hole in the left side of the line and ran 85 yards into Ohio State lore. As he crossed the goal line with no would-be tackles near him, he delivered the knockout blow in the Buckeyes’ 42-35 victory. Along the way, he may have left a lot of college football perceptions vanquished in his wake. The snarky way to refer to Elliott’s game-defining burst is with the term Big Ten speed, a nod to the SEC speed we’ve heard all about for years. Yet the reality of this victory, coupled with a pair of Big Ten wins earlier in the afternoon, is that Thursday could be remembered as the day when the axis of college football power shifted -- at least marginally -- away from the South. No. 4 Ohio State will play No. 2 Oregon in the inaugural College Football Playoff final. It will be the first time an SEC team won’t play in the title game since 2005, and the second straight season in which there won’t be an SEC champion. It can be dangerous to read too much into a few bowl wins (and the Michigan hiring of Jim Harbaugh), as the league has won just two national titles since 1970. (Or half as many as Nick Saban.) But the SEC West’s 2-5 record this bowl season -- thank goodness for Arkansas and Texas A&M -- shows the college football world is flattening out. When next year’s preseason rankings are released, there will be more attention paid to regions outside the Southeast. 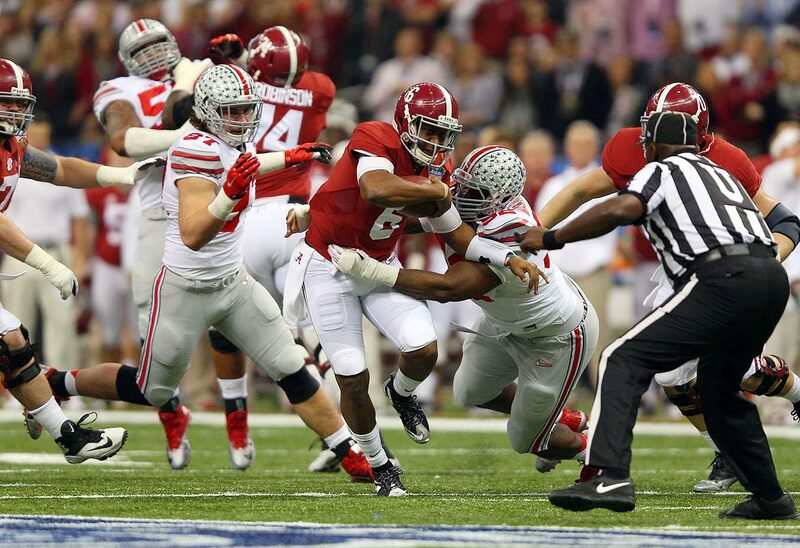 “I’m tired of hearing about the SEC,” Ohio State defensive tackle Michael Bennett said. 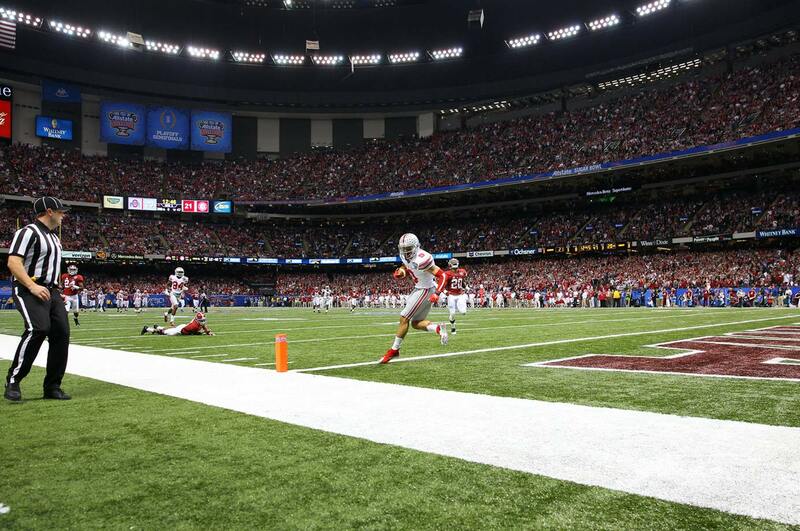 Ezekiel Elliott ran for a Sugar Bowl-record 230 yards and scored twice, including an 85-yard touchdown run that essentially clinched the Buckeyes victory with 3:24 remaining. 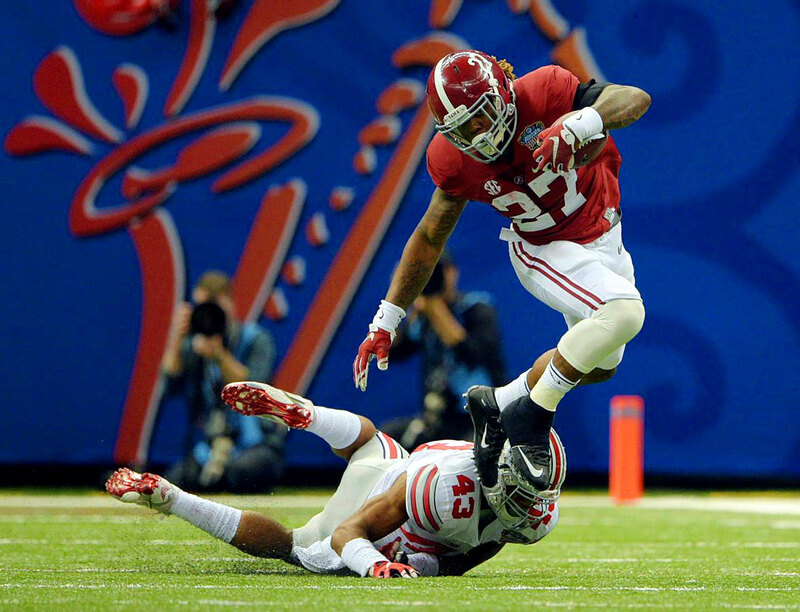 Derrick Henry led Bama in rushing with 95 yards and a touchdown on 13 carries. Amari Cooper catches the first of his two touchdowns in the game. Jalin Marshall loses his helmet as he is unpended by Jarrick Williams. Cyrus Jones returns an interception 32 yards early in the second quarter. 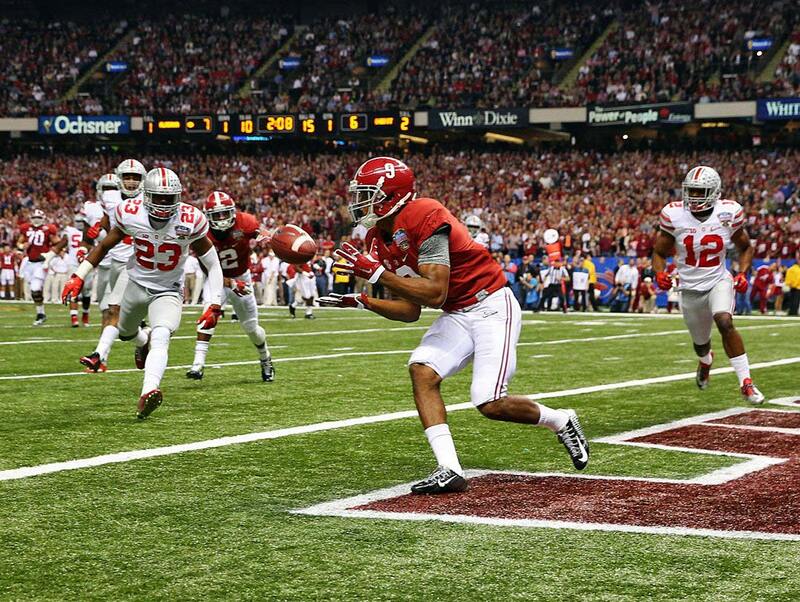 T.J. Yeldon scores a 2-yard touchdown run that put Alabama up 21-6 about midway through the second quarter. Michael Thomas catches a 13-yard touchdown pass to close the gap to 21-20 at the half. Devin Smith scores a 47-yard touchdown reception that put the Buckeyes ahead for good early in the third quarter. Steve Miller heads to the end zone to score on a 41-yard interception return late in the third quarter, giving the Buckeyes a 34-21 lead. 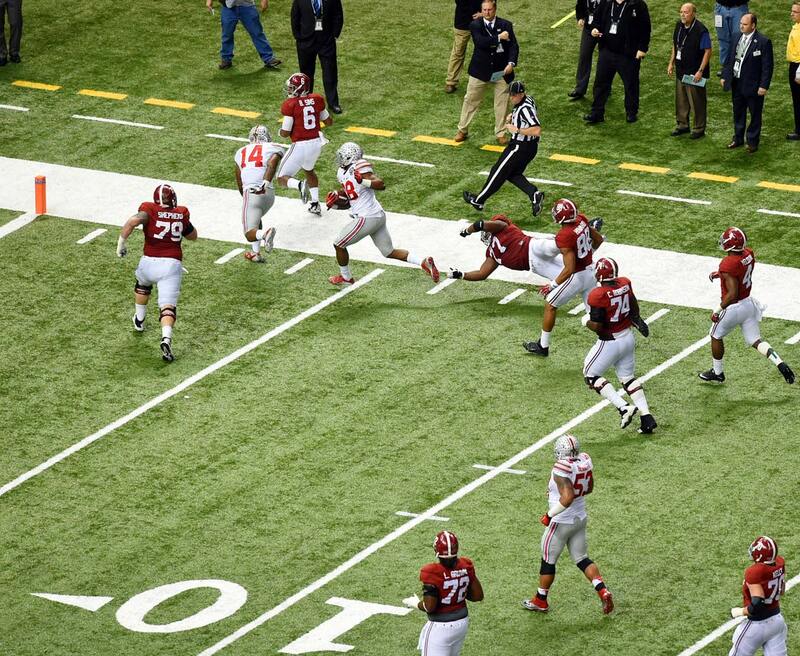 Blake Sims rushed for a touchdown and threw for two, but finished the game with three interceptions. 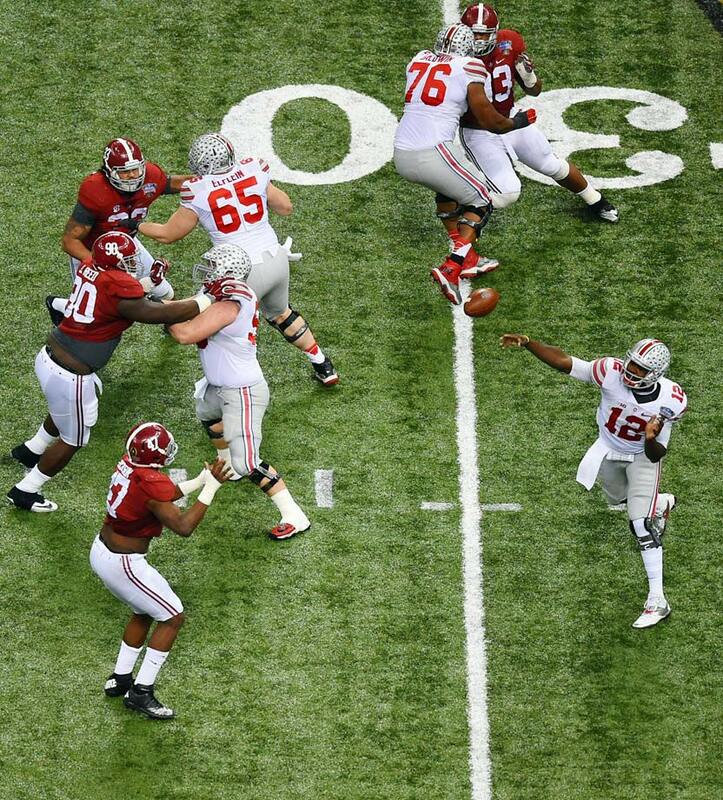 Cardale Jones turned in another savvy performance in his second college start, throwing for 243 yards. Jones also ran for 43 yards and converted a crucial third-down play with a spinning, 1-yard dive and Ohio State clinging to a 34-28 lead. 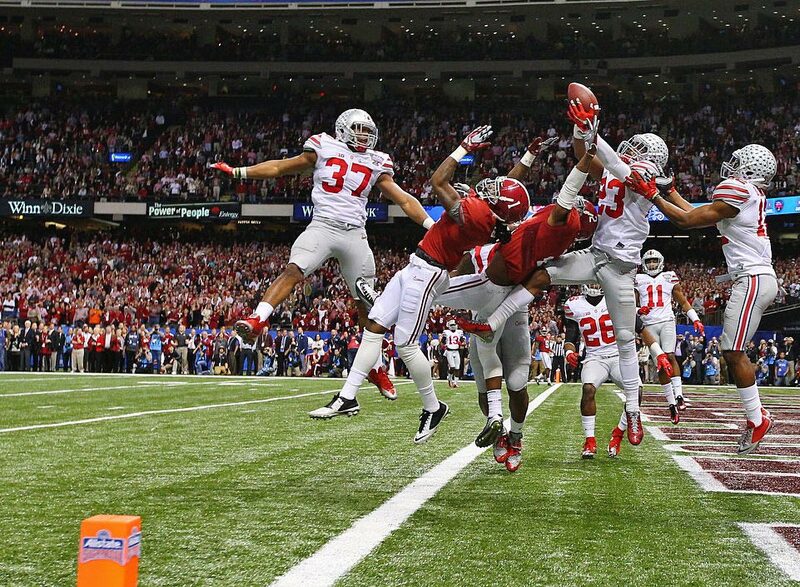 Tyvis Powell intercepts a last second hail mary to seal the win for Ohio State. 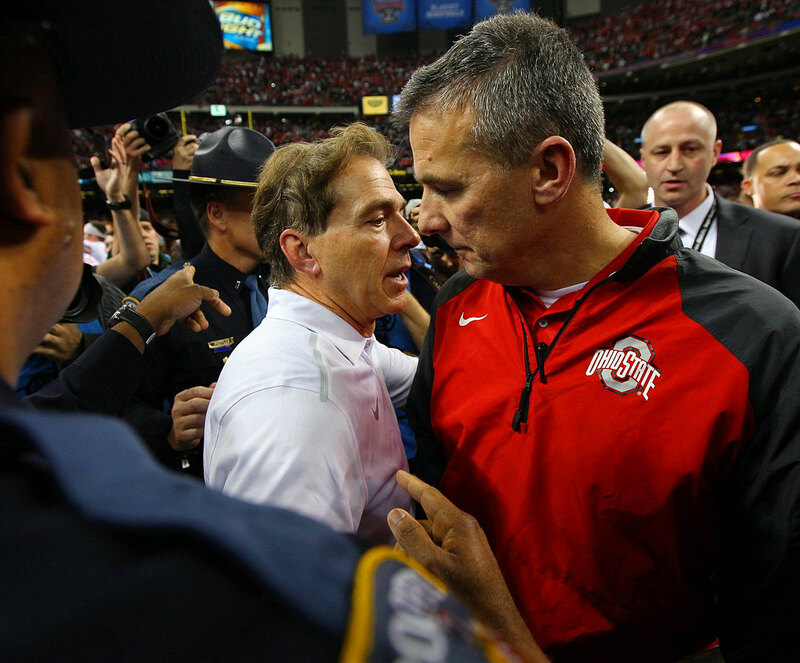 Denied a shot at his fourth national title in six years, Alabama coach Nick Saban congratulates Urban Meyer on his team's victory. 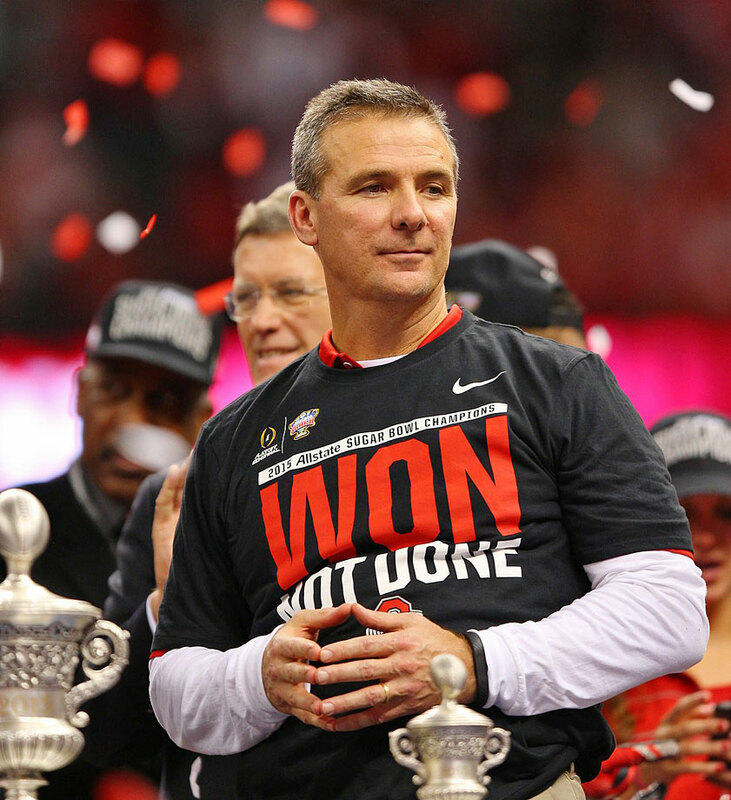 After just three years on the job at Ohio State, Meyer's one win away from a national championship. Other than in the trenches, the SEC’s supposed areas of superiority were its speed and depth. 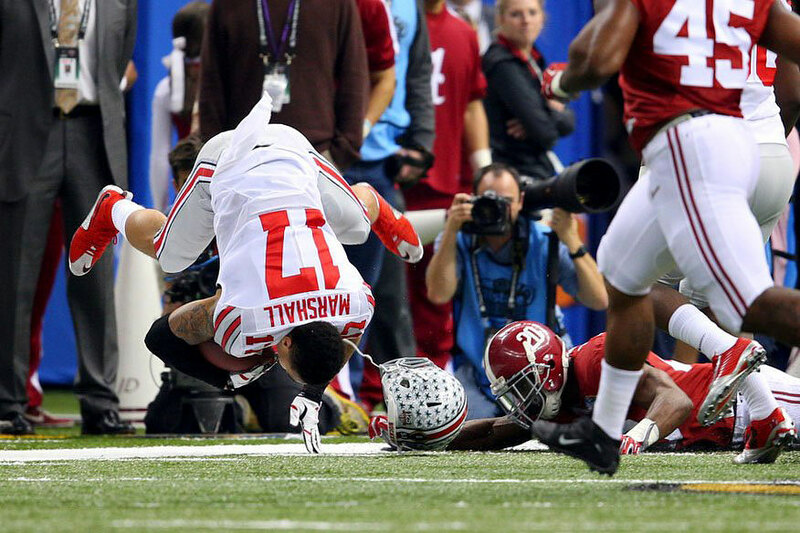 But Ohio State proved to be every bit as dynamic as Alabama. “I know how fast I am,” said wide receiver Devin Smith, who caught a 47-yard touchdown to give the Buckeyes a 27-21 third-quarter lead. And it’s hard to question Ohio State’s depth as Cardale Jones, the serendipitous third-string quarterback, led his team to its second consecutive win on a prominent stage. The looming matchup against Oregon on Jan. 12 will give Jones a chance to complete one of the most improbable runs in college football history. The setting, the opponent and the sight of grinning Big Ten commissioner Jim Delany dripped with irony on Thursday night. Delany beamed as he walked on to the field after defensive back Tyvis Powell caught his game-clinching interception as time expired. Delany finally experienced the end of a bowl season in which he didn’t have to hear questions about his league flopping in the spotlight. Consider all the factors that led to this moment: After the 2011 season, Alabama played LSU for the national title here in New Orleans. That game provided the peak of SEC braggadocio. No one will admit it publicly, but the fact that two SEC teams played for the title that year and shut out the other power leagues led to the paradigm shift in thought with commissioners and presidents that ended the BCS. If Delany wasn’t the last playoff convert, he was one of them. He embraced the stale party lines about regular-season sanctity and the importance of the bowls, as well as laughable excuses like players missing class time. So, when I asked Delany if there was anything to this moment -- a Big Ten team finally breaking through against the SEC in New Orleans -- his smile could have lit up the Eiffel Tower. “No irony,” he said, his grin belying his words. “It’s kind of a reset,” he said of the Big Ten’s inferiority narrative. While Elliott’s mad dash offered the game’s defining highlight, it may resonate through the Big Ten and beyond for years to come.